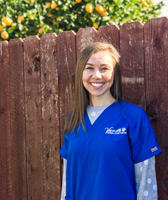 Our friendly and dynamic staff are here to help keep your pets safe, happy, and healthy. They are dedicated in making sure your pet leaves with the best care they can provide. Our staff also has a wide variety of experience and talent and are happy to share them! Brandon loves to watch his patients grow up and be part of their life journey. His hobbies include writing, playing video games, watching movies and cooking. He has one cat, named Chalupa Batman, one dog named Finnick, and a husband who is more work than the other two. Brandon joined our team in 2014. Andrea has a huge passion for animals. 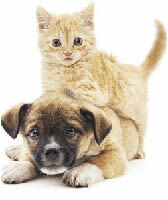 She may be new to veterinary medicine but would love to have every client and patient leave with a paw-some experience. Andrea has one Australian Shepherd named Ollie and One grey rescue cat named Suzie. In her free time, Ollie and Andrea love to go hiking or go to the dog park. She also loves going to the beach and exploring the outdoors. Andrea joined our team in March of 2018. Heather gets satisfaction from helping owners with their pets. Her hobbies include fostering animals, drawing, and going to the beach with her daughter. She also has 2 dogs and 2 cats at home. Heather does lovely monthly drawings on our whiteboard. Heather joined our team in 2015. Kelly loves connecting with clients and their pets. In her spare time she loves fostering animals and spending time with her Family. She has a husband, daughter, 2 dogs and 1 crazy cat at home. Kelly joined our team in 2015. It has been said that Joe was not so much hired by ACC, as simply congealed from its walls. The truth is that Joe probably has more history with ACC than anyone, save Dr. Barnes. When Joe was 12, while bowling, his father convinced Dr. Cobble to give Joe a job to get him out of the house. Little did they know at the time that Joe would be the single most important thing to happen to ACC. 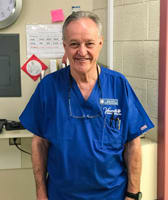 Having seen the hospital grow into a new building in 1962, and having helped train no less than 30 veterinarians over the years, Joe is by far one of the most skilled and experienced veterinary technicians today. Jess is very committed to veterinary medicine. Her goal is to help strengthen the bond between owners and their pets. She likes to treat each pet like they are her own while they are at the vet. Her hobbies include hiking with her 3 dogs, and spending time with her 2 cats. Jess hopes to one day own her own mini pig! Oink Oink! Jess joined our team in 2016. Samantha has a great big heart. She loves animals and being able to give owners a sense of relief when they are worried. She has a lot of hobbies including watching old movies, listening to music and playing with make up. Samantha also enjoys spending time at the beach or going up to Lake Tahoe as well as spending times with friends and family. Samantha has a wonderful daughter that enjoys shopping and spending time with their very rambunctious silver Siamese cat; who actually enjoys water and will come running when he hears you turn on the water. Samantha joined our Vacaville Animal Care Center family in 2016. Carrie comes to us all the way from Ohio! She has been with us since September of 2018 and loves to ride her motorcycle to work on those sunny California days. 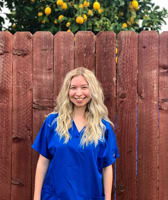 Not only does she love to live in the moment and enjoy life, she also loves passing that feeling on to all of the patients that come in every day. Carrie has 2 cats, a tortoise named Daisy and an orange tabby named Simba.